I really had no idea how much soya chunks will attract my kids. 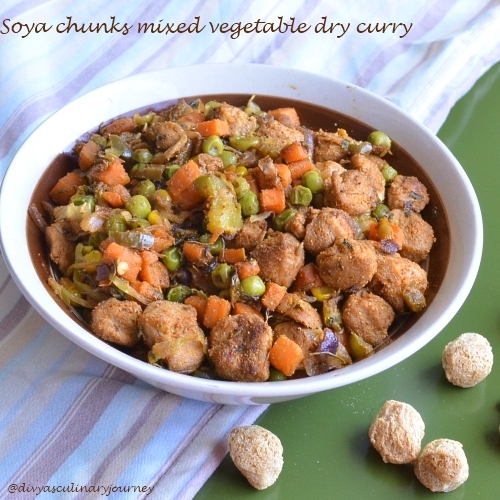 I made this dry curry with soya chunks and mixed vegetable, to go with chappathis for dinner. As soon as I cooked them, transferred them to a bowl and was taking some pictures of them to post along with the recipe, both kids couldn't resist, they started eating right from the bowl. So making them eat today's dinner was easy. What are the ingredients needed? 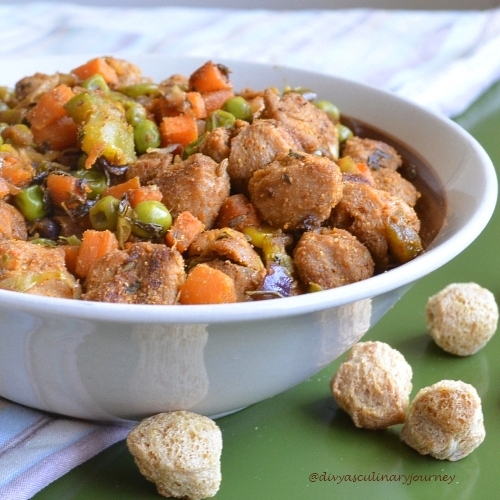 Cook soya chunks as per the package instructions and squeeze out the excess water and set it aside. Chop the onions and bell pepper. Heat the oil in a skillet and add the fennel seeds and fry for a minute or two, then add the chopped onions, bell pepper and saute for 2- 3 minutes. Then add the ginger garlic paste, chilli power, coriander powder , mix well. Then add the shredded cabbage, mixed vegetables, soya chunks and add salt to taste, mix well. In a low flame, cover and cook till its done. Then add the kasoori methi leaves, mix them and then let it sit for sometime and then serve. Very delicious and healthy curry. Looks tempting. Wat an awesome and protein rich curry..cant wait to try this combo soon. Drooling .. looks so yummy and delicious. that is a power packed curry.. very healthy..
healthy and nutritious pack of sabji..
very interesting and healthy too! Vanakkam (Greetings) and Welcome to Divya's Culinary Journey. Thank you for visiting my space. I appreciate the time you spent browsing my recipes. I would love to receive your comments, feedbacks, inputs and any suggestion to improve the blog. Hope you found what you are looking for and please visit again for more recipes and latest updates. Thank you once again !! All Rights Reserved. © Divya's Culinary Journey. Simple theme. Powered by Blogger.